The photo shows the author Kate Morejohn on one of her runs on the Marin Headlands on a cold day. This is where she got the idea for Maria and the Lost Calf. The author reflects upon life then and now: “I was wearing running tights, so it was cool. Not too hard on us to exercise – walk, ride a bike, run, ride a horse – so much nice gear for us to have while we workout. You can see I am holding a hand held water bottle – nice for me. But Maria and all those hard working dairy farmers? No, they didn’t have warm tights, a water bottle, and a nice car to end up at. More than likely they had muddy boots, long skirts, or dirty work pants, that did not do much to keep the cold out, and when they got thirsty or hungry…well, they kept working and waited till they got back to their farmhouse. 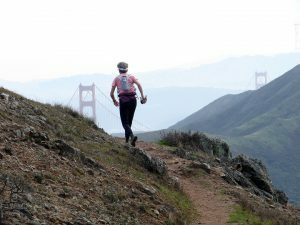 If you go to the Headlands, as you hike, drive, or whatever, imagine a different Headlands – no Golden Gate Bridge in the distance, no city on the horizon, no huge boats in the bay…. It was a different world and it is so interesting to delve into the past and make some of it come alive again”. Maria and the Lost Calf, is a bilingual (English and Portuguese), magnificently illustrated children’s book for ages 2-12, published by Portuguese Heritage Publications in partnership with Fundacao Luso-Americana (FLAD) and the Sausalito-Cascais Sister Cities Foundation. The Marin Headlands area, (and probably where you live, too) is full of historical spots. That is how I got the seed in my head for my story, Maria and the Lost Calf....I saw remnants of old dairy farms, fences, barns…..and the story grew into my book. Heritage is a wonderful thing…and we all have one….and I have been realizing that it is good to find out about your heritage while you can. The people who know about our past will be gone, and with them, the stories, the history. My maternal grandmother was from Ireland and came to this country as a young woman, met my grandfather, married. They had a ranch in South Dakota, raised their children, one of which is my father, and I was a young adult when she died. I should have asked her questions- oh, the questions I wish I would have asked!! But I’d didn’t , and I know almost nothing about her, and no one can tell me now.And my husband’s paternal grandparents were from Spain, same story-we even had our own children when they died- and did we dig into their history? Unfortunately not.Talking to the Azoreans I met at a Portuguese Festival a few months ago, I was entranced, I was fascinated by their stories….listening to them put me on an island in the Azores, and I could almost see their lives. I truly hope their children and grandchildren are digging into their pasts and preserving memories. If you visit Northern California, try to include a trip to the Marin headlands, and West Marin, and the Point Reyes area in your visit. It will certainly be a beautiful and worthwhile visit, and will give you an idea of why many Azorean immigrants settled there, and worked on dairy farms. The climate and landscape, and proximity to the sea is very like the Azorean Islands. I think the immigrants who came must have had tugs on their hearts, seeing such a familiar landscape. There are Visitor Centers at the Headlands, hiking trails, and you can drive to some beaches. And as you are there, maybe on a lonely, foggy trail, think of Maria (from my book Maria and the Lost Calf), and how she loved living there on their dairy farm.